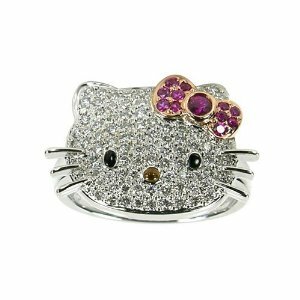 With the finest gems adorning her face, the Hello Kitty by Kimora Lee Simmons Gemstone "Simply Kitty" Ring is a must-have item for any fan. Made from high-quality, 18k white gold, the ring uses glittering gemstones to their full effect. Hello Kitty's darling face is inset with white diamonds that offer a total carat weight of 3/8 along with H1 color and I1-12 clarity ratings. Her black eyes feature onyx while her little button-nose is studded with a citrine stone. Finally, her iconic bow is inset with rubies and brings the total gem count to an impressive 96 stones. The rest of the ring is made from high-quality 18k white gold for durability. This impressive pendant includes a commemorative gift box, so it's already packaged as the perfect gift.